From the moment you step on our lot until the time you drive away in your truck or trailer, your buying experience with Capitol Custom Trailers & Coaches is our number one priority. We encourage you to use the expertise and resources of our sales staff; they are here to help you find the right truck or trailer at the right price. Call us today at 301-474-6800! 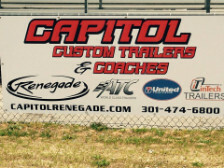 Here at Capitol we have a great selection of New and Used Trailers, Toterhomes, and Motorcoaches. We can build you the trailer to meet your needs as well, whether its to haul a race car, your classic car, a BBQ or Concession trailer, Vending trailer, the options are endless. Give me a call today to get you set up and on the road. From the moment you step on our lot until the time you drive away in your next truck or trailer, your buying experience with Capitol Custom Trailers & Coaches is our number one priority. We encourage you to use the expertise and resources of our sales staff; they are here to help you find the right truck or trailer at the right price. Call us today at 301-474-6800!